Head back in time for a little something of everything at the Museum of World Treasures. Start in prehistoric times and come face-to-face with the bones of monsters past, then trace your way up to modern warfare. If you’re traveling with kids, ask at the admission desk for scavenger hunts for their age groups. 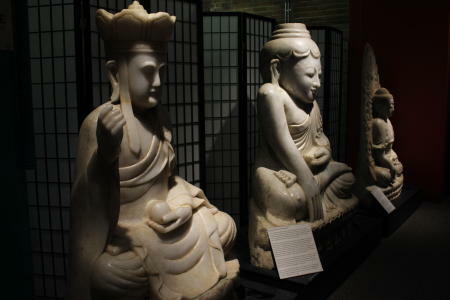 The Museum of World Treasures was founded in 2001 and quickly outgrew its home at the Garvey Center in downtown Wichita. It moved to the Farm & Art Market building in Old Town Square where it sits now, housing thousands of artifacts from around the globe. There are generations and generations of artifacts and learning experiences available as you journey through time from the age of dinosaurs through the modern age. Experience the sixth-largest Tyrannosaurus rex in the world, standing nearly 40-foot-long right in the middle of the museum. Ivan would have weighed more than 10,000 pounds, but that’s not the biggest T. rex ever recorded. The largest known would have been nearly 12,500 pounds and 42-foot-long. Ivan would have been a dinosaur of teenager-like age based on his size. Gary Olsen and Alan Komrosky found Ivan in 2005 in Harding County, South Dakota. 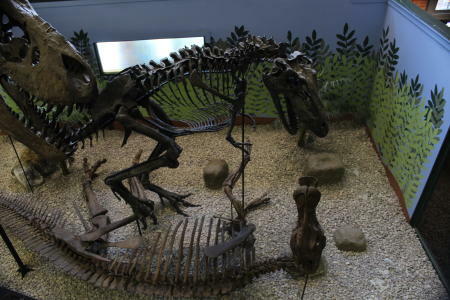 The skeleton was found in the Hell Creek Formation, a layer of rock where several dinosaurs have been found including: T. rex, Triceratops, Edmontosaurus, Ankylosaurus and Pachycephalosaurus. Ivan’s exhibit was opened at the Museum of World Treasures in May 2007 and became a permanent fixture at the museum on Jan. 16, 2018. Children can let their imagination run wild in the new Ivan&apos;s Playhouse, located on the third floor of the museum. With fun activities like crafts, reading, a treehouse and different backdrops and full stage, it&apos;s the perfect place to take the kids after exploring the museum. Heading through history, learn about the animals and creatures alive during the Ice Age. Visitors can experience the evolution and lifestyles of many mammals and fish species from the Cenozoic Era, the time that directly right after the extinction of dinosaurs. The exhibit explores the shapes and functions of these animals’ bodies and the similarities and differences between those animals and ones of today. The museum’s newest exhibit includes Hindu and Buddhist tradition and religious artwork. It teaches visitors about the art and artifacts from several Asian royal dynasties including the Majapahit kingdom of Indonesia. As this new exhibit keeps evolving, keep an eye out for a Chinese Flying Dragon and new artwork. Guests can also enjoy an interactive activity in this exhibit, helping Han chancellor Cao Cao escape his enemies in a challenging puzzle. If you’re into cowboys and the Wild West, this exhibit is perfect for you. Hollywood has had a heyday, sometimes stretching the facts a bit. Just how glamorized has the true Old West been? Find out with this exhibit, as you take the journey through what was really happening at the time. Young and old alike can learn Old West slang with an interactive activity and look at custom military artifacts, a Gatling gun and several photos and descriptions tracing the journey of westward expansion. Have you ever wondered if you’re in line with European royalty? From the Dark Ages through Medieval times, trace the lineage of kings and queens in England, France, Spain and their familial ties and marriage-alliances. This exhibit goes through major cultural events explaining the periods, and showcasing letters written by famous monarchs like Queen Elizabeth I. Be intrigued on this walk through the grave goods and artistry from beyond the grave. With artifacts from Latin America and South America, look at items coveted by Spanish conquistadors. This exhibit has three new interactive activities including a mix-match game, learning how to count with the Mayan number system and a touch-and-feel option to get up-close-and-personal with several historical materials. History comes alive throughout the museum, but perhaps not as much as it does with a large chunk of the Berlin Wall on display. The 4.5-ton, 12-foot-tall piece of solid concrete is an original piece of the wall physically dividing Berlin, Germany, from 1961-1989. This piece is on loan to the Museum of World Treasures from the American Overseas Schools Historical Society, whose archives are in Wichita. Head out to see this living piece of history today. 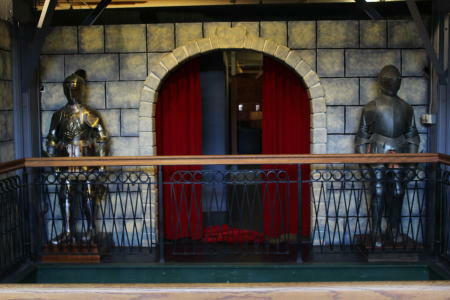 Learn more about history with these other interactive museums.